Obiter ended the year doing what we love most, sending two new books into the world! 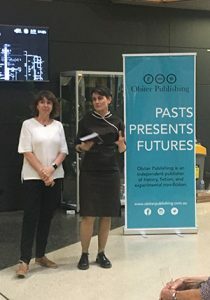 We raised a glass of congratulations to Sarah Madden in Melbourne last Tuesday evening at the launch of her debut novella Blue in the Red House. And we learned, finally, where the name for Sarah’s protagonist, Ms De Beer originated. We had been trying to conjure metaphors of diamonds but, no, the name is simply a fun nod to a certain amber brew of which Sarah is quite fond! It was a pleasure to work with Writers Victoria to celebrate Sarah and her work and we thank them for their hospitality and generosity. director Fiona Tuomy, who was also Write-ability’s founding Mentor-in-Residence. We would also like to thank Katherine Bode, our series editor for ‘To Be Continued’, and Imelda Whelehan, who selected the stories for the latest title in the series and wrote the introduction, and Martin Willis who read excerpts from the book at its launch. It has been a pleasure to work with them on Christmas Eve in a Gum Tree and Other Lost Australian Christmas Stories. Last Monday in Canberra, Marnie Hughes-Warrington did the book proud in her launch speech in which she pointed out that despite the heat and disastrous weather events in Australian Christmas stories they all do end up being about love: love between sweethearts, love between parents and children, love lost, love earned, love that endures time and place. Pic right: Professor Imelda Whelehan and Professor Marnie Hughes-Warrington. If you are in Melbourne on 11 December, please join us for the launch of debut author Sarah Madden’s magic realist memoir Blue in the Red House. We are very excited to mark this special occasion with Writers Victoria, where Sarah was a Write-ability Fellow. Sarah will be in conversation with writer and director Fiona Tuomy, who was also Write-ability’s founding Mentor-in-Residence. And there will be champagne of course! RSVP at the Writers Victoria website. If you can’t join us Blue in the Red Houseis out now and available through the Obiter online store. Obiter Publishing is excited to announce the forthcoming release of our first ‘Futures’ experimental non-fiction title, Blue in the Red House. Blue in the Red House is a hybrid memoir/magic realist novella from debut author Sarah Madden, which recreates her experience of being diagnosed with Autism at age 34. Sarah Madden grew up in New Zealand and has been based in Victoria for the past 5 years, after spending a number of years living in the Middle East. Since landing in Australia, Madden has rediscovered her love of writing and words, and was awarded a Write-ability Fellowship by Writers Victoria in 2014. Madden writes fiction, memoir and poetry, most with a lyrical, slightly magical treatment woven through the threads of the everyday. Madden has been published, as Sarah Widdup, by Underground Writers, The Big Smoke and Hot Chicks with Big Brains. In Blue in the Red House, readers follow the journey of Ms De Beer who seeks out a doctor to assist with removing her eyes, figuring she no longer needs them. She is surprised to learn the true source of her concerns. Ms De Beer cannot see red. As a result, she has been leaving a trail of heart-blood behind her everywhere she goes. Reeling from this information, Ms De Beer sets out on a journey to rediscover herself. Along the way she discovers far more of herself than she expects. But piecing all of the parts together and learning to see clearly will be harder than she thought. Through the journey of Ms De Beer, Madden recreates her own story of being diagnosed as autistic. The story reimagines Madden’s sensory perception of the world around her and her place within it. In fiction, Madden illuminates the truth in ways that strict facts often cannot manage. Blue in the Red House will be released in November 2018. Local Canberra media has been quick to respond to the launch of Obiter’s Pozible campaign for Tears, Laughter, Champagne. The story of friendships forged through food and fire resonates with Canberrans who can all tell you where they were and what happened on 18 January 2003. Kathryn Vukovljak discussed the book with Karen Downing for City News and Elias Hallaj has given it a plug on RiotACT. Some 40 wonderful people have pledged to the project already. With 22 days to go we need some more supporters to reach our target! Singed Sisters Liz Tilley, Liz Walter, Alison Mills and Karen Downing joined Lish Fejer on ABC Radio Canberra’s ‘Sunday Brunch’ on Sunday 15 October to talk cakes and their upcoming cookbook come memoir Tears, Laughter, Champagne. Liz W bought along Aunty Pat’s Chocolate Cake, a family recipe that tastes like chocolate cake used to take. The Sisters love an opportunity to get together and love a chat – you can listen to them on the ABC website and get Aunty Pat’s recipe as well. You can also help us reach our funding target to make this project a reality at Pozible. Spread the word. Our Pozible campaign for Tears, Laughter, Champagne is now live! On 18 January 2003, four bushfires that had been burning in the Brindabella mountains for more than a week combined and roared into Canberra’s south-western suburbs, destroying 500 homes and claiming four lives. Have you ever wondered what happened to the people behind the headlines? Tears, Laughter, Champagne is the story of nine women who forged an unbreakable bond in the weeks and months following the fires, brought together by the one thing they had in common, loss. In this cookbook come memoir these ‘Singed Sisters’ recount their fifteen year journey from the day the fires changed their lives. Share in their story of recovery through the recipes that gathered them together and celebrated the milestones of rebuilding what was lost. 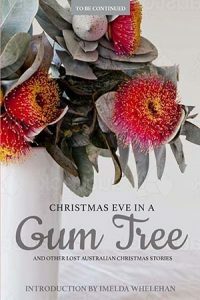 As devastating bushfires become part of life for so many communities around Australia this book will serve as a reminder of the enduring nature of friendship, good food, and great champagne in tough times. This book is also a chance for the Singed Sisters to pay forward the charity and kindness they received in the aftermath of the fires. All profits from the sale of this book will go to YWCA Canberra – chosen by the Singed Sisters because of their work in housing support, child care services and family counselling as well as their advocacy on gender equity and women in leadership. To make this book a reality there are some upfront costs to cover such as photography, design, layout and printing. The Singed Sisters have been talking about this book for over a decade now – they are ready to make it happen. And with just a little bit of help from you through our Pozible campaign it will! We would be very grateful if you could share this email with friends and family who might also like to support Tears, Laughter, Champagne. Thank you! Katherine Bode has given us her introduction to How I Pawned My Opals and Other Lost Stories and, as the best introductions do, she gives us a greater appreciation of the work of Catherine Martin. Martin’s family (the Macaulays) began their life in Australia as farm labourers but by the time Catherine moved to Adelaide in 1876, aged 29, she was well educated, fluent in a number of modern languages, particularly German, and widely read in literature, theology and philosophy. Although Martin escaped the extreme poverty of her childhood, she had to work to support herself for much of her life. Catherine married Frederick in 1882, when she was 34. He was an accountant, social reformer, and writer. The marriage seems to have been a happy and equal one. They shared a belief in social justice, a desire to write and, and together they travelled the world. Martin described Frederick and herself as “comrades”. No wonder, then, that Martin’s stories have an independent and strongly delineated female character at their core. These women are different in so many ways but they are all decisive and determined, and resist or actively go against the mores of their respective societies. It is Bode’s fascinating insight that although Martin, with her depiction of Stella Courtland in her most famous work, An Australian Girl, has long been seen as responsible for creating a uniquely Australian form of the ‘New Woman’, these lost stories show that she conceived of this figure as a global phenomenon, an emerging sisterhood of women independent in thought and action. We are looking forward to introducing these women to you! Satirical photo from 1901, with the caption ‘New Woman—Wash Day’, US Library of Congress.